Written by Emily J. Symmes, UCCE Area IPM Advisor; Bob Van Steenwyk, UCCE Entomology Specialist; Bill Coates, UCCE Farm Advisor Emeritus, San Benito, Santa Cruz, Santa Clara, and Monterey Counties; and Janine Hasey, UC Farm Advisor, Sutter, Yuba, and Colusa Counties. 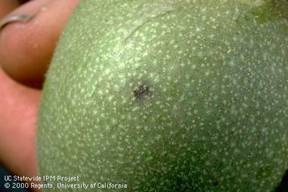 Walnut husk fly (WHF) continues to plague walnut production in many areas, often requiring multiple insecticide applications each growing season to achieve adequate control. This pest provides particular challenges to an integrated pest management program due to the nature of its life cycle (one generation per year with a long emergence period) and lack of natural enemies. As a result, best practices for management rely heavily on monitoring and insecticide treatments. Precise timing based on monitoring method and rotation of chemistries to minimize resistance risk are keys to successful long-term control of this pest. The colorful husk fly has a yellow spot on its back, dark triangular bands at the wing tips, and is about the size of a house fly. 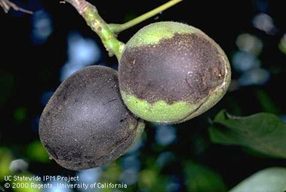 English walnut varieties such as Tulare, Hartley, and Franquette are the most susceptible to husk fly damage although all varieties can be infested. Walnut husk flies produce one generation per year overwintering as pupae in the soil. They emerge as adults in the Sacramento Valley from early June through September, with peak emergence in July in recent years. About one percent of the pupae survive for two years in the soil. Life Cycle: Understanding the life cycle is important to spray timing and effective control. After emergence, it takes a female about 2 weeks to mate, develop eggs and start laying them into the walnut husk. 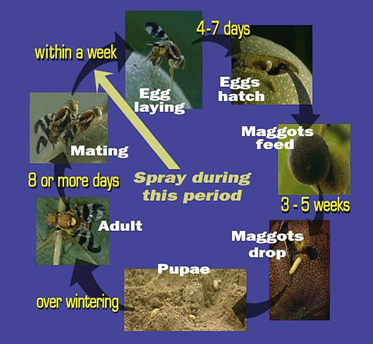 The most effective spray timing is the period when the female is developing eggs before egg laying occurs. Once eggs are deposited, they hatch into white maggots within about 5 days and feed on the husk for 3 to 5 weeks before dropping to the ground, burrowing into the soil, and pupating. Damage: First symptoms are the small “stings” in the husk where eggs were deposited. The husk turns black and soft as maggots feed inside the husk, causing stains on the nutshell which cannot be removed by normal bleaching. Stained shells cannot be sold in-shell. Early infestations can have a significant impact on kernel quality and substantially reduce the crop’s value. Walnut husk fly oviposition sting. Walnuts infested with WHF larvae. Monitoring and Spray Timing: Since WHF is not driven by temperature and development is related to food availability, there are no degree-day models as with codling moth to time sprays. 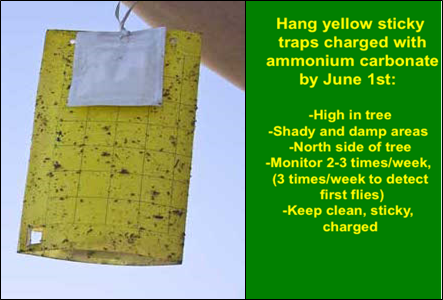 Yellow sticky traps charged with an ammonium carbonate lure work best. A summary article regarding the efficacy of available traps/lures for WHF monitoring was published in 2014. Past damage and “hot spots” will help with trap placement. Walnut husk fly is not likely to stay confined to a single orchard if there are other walnut orchards within ½ mile. Each orchard should be monitored individually for WHF activity to best determine if and when to treat. Walnut husk fly trap with ammonium carbonate lure. Monitoring should begin earlier than the June 15 historical guideline (no later than June 1 in the Sacramento Valley is the more recent recommendation). Some reports of late May catches in 2016 further support the “earlier-is-better” practice – even if counting zeroes for a few weeks. Traps should be hung high in the canopy (minimum 2 per 10 acres) in dense foliage on the north side of trees and checked 2 to 3 times per week. Treatment timing can be based on one of three monitoring methods (the first two have typically been most effective). Detection of eggs in trapped females. This is a simple process that requires slightly more time than counting overall trap catches. Females can be distinguished from males by the shape of the abdomen (pointier in females) and color of the front leg (female leg is entirely yellow, male leg is black close to the body). After females are identified, gently squishing the female abdomen will squeeze out eggs if they are present. Eggs resemble small grains of rice. Treat when the first female with eggs is found (unless using GF-120® – see below). Although past guidelines have stated that the treatment window is one week after egg detection, in practice there is often a lag time in getting the treatments out and trap checks (even 2 to 3 checks per week) may not be frequent enough to represent initial egg development in the female population. Therefore, treating as soon as possible after eggs are detected is the best option to minimize infestation. In low- to moderate-pressure orchards, treat when a sharp increase occurs in traps. In high pressure orchards or if using GF-120®, treat when any flies are detected rather than waiting for a sharp increase in catches. Stings on nuts is the least preferred method, as damage has already occurred. However, examining nuts for stings can provide indication of efficacy of your spray program. Treat at first sting. If using the sting method, full cover neonicotinoid materials that have some ovicidal activity (e.g. Belay® or Admire Pro®) mixed with an adulticide will provide best control. Continue monitoring throughout the season. After emergence, it takes two weeks for females to mate and develop eggs before they begin laying. Short-residual insecticides plus bait will generally kill WHF for 7 to 10 days. Target subsequent applications at 2 to 4 week intervals based on the efficacy of the previous spray. Clean traps the day after application and check 3 to 4 days later. If the number of flies drops to near zero, the spray was highly effective and a longer treatment interval may be used. If post-treatment catches increase or eggs are detected in trapped females, and the residual period of the previous treatment has elapsed, additional treatments may be required if harvest is more than three weeks away. If you choose to monitor for eggs using a dissecting scope or hand lens, use the photos below to help identify gender and recognize eggs. At the first appearance of gravid (with eggs) females there is about one week before egg laying occurs but plan to spray immediately. This procedure is not used if you are using GF-120 bait because these sprays need to be applied as soon as flies are caught rather than waiting for the gravid females. Visit the UC IPM Pest Management Guidelines to get details, photos of sexing flies and finding eggs, and monitoring forms. Treatment Options: There are several materials effective against WHF, both for conventional and organic orchards. All materials should be applied with a bait (except GF-120® which contains its own bait), except in high population orchards with extensive previous damage. In this case, full coverage sprays may be required to achieve adequate control. Keep in mind that rotation of chemistries (based on IRAC Mode of Action classification) is critical to minimize resistance development for pests that are treated multiple times each season. Proper aphid management can also help limit movement of WHF within and between orchards by reducing honeydew accumulation (a food source for adult WHF). The UC IPM Pest Management Guideline lists insecticides, baits, and rates for WHF. The table below represents a summary of insecticide efficacy data for WHF from over 10 years of research conducted by UCCE Entomology Specialist Bob Van Steenwyk and UCCE Farm Advisor Bill Coates. Trials took place in a high WHF pressure Hartley orchard in San Benito County, CA. Treatments were applied with a hand-gun orchard sprayer operated at 200 psi with a final spray volume of 300 gal/acre. Three to four applications were applied (depending on year) timed according to UC IPM Guidelines based on trap catches (mid- to late-July, mid-August, late August, and/or early September). Trials consisted of four single-tree replicates each year. All applications included NuLure® bait and an adjuvant (Dyne-Amic®, Latron-B®, or Exit®) at label rates. Efficacy ratings are based on WHF infestation of nuts (125 nuts per replicate) before commercial harvest (mid-September). Detailed annual reports are available in the Walnut Research Reports Database. These data are based on research trials spanning over 10 years. ALWAYS CHECK CURRENT LABEL FOR REGISTRATION STATUS, ALLOWABLE RATES, AND OTHER RESTRICTIONS.